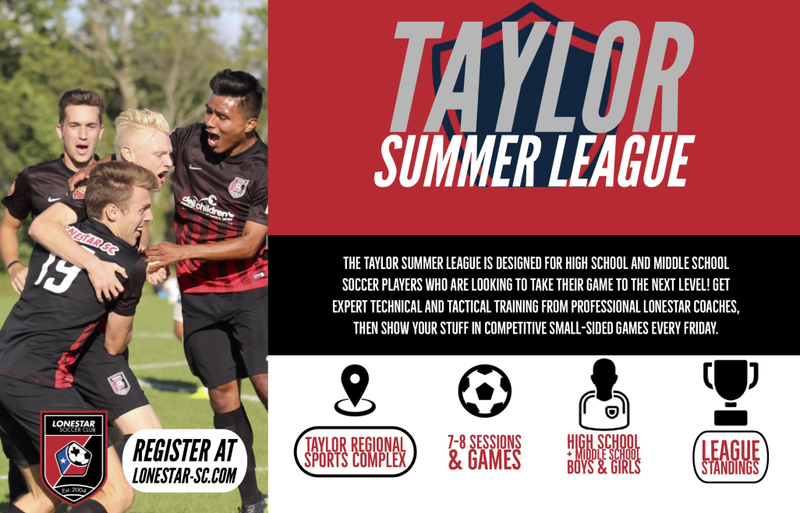 The Taylor Summer League is designed for high school and middle school soccer players who are looking to get technical and tactical training and then play in a small sided format. The small sided format will be a league where the teams are assigned by Lonestar staff and matches are played every Friday after the technical training. Every Friday, players will be trained for 20 minutes by Lonestar staff on a technical topic, then play on their assigned teams. Standings will be updated by each Monday after the Friday evening matches. Every player will receive a uniform kit for the league and 1st place medals will be given out to the teams who win their division. Standings will be posted each week. Taylor Regional Sports Complex - Soccer fields. Friday June 14th - Friday August 2nd 27th - 6:00pm to 7:30pm. Rain outs will be canceled and make ups set up if needed. (July 6th - Friday) will be based off attendance confirmations. Divisions will based off final registration numbers by May 31st. Coed will be used depending on final numbers. Schedule will be posted by June 1st. Each player receives match t-shirt.